Malawi should amend national legislation to comply with international law governing police and prison officer use of firearms. International law restricts such use to where it is necessary to confront an imminent threat of death or serious injury or a grave and proximate threat to life. The 1994 Constitution of the Republic of Malawi protects fundamental human rights. Section 16 stipulates that: "Every person has the right to life and no person shall be arbitrarily deprived of his or her life." Section 19(3) provides that: "No person shall be subject to torture of any kind or to cruel, inhuman or degrading treatment or punishment." These rights are non-derogable. The Malawi Police Service is addressed in Chapter XV of Malawi’s Constitution.Constitution of Malawi, 1994, ch XV s 153(1)-(4).Its duty is to protect "public safety and the rights of persons in Malawi according to the prescriptions of this Constitution and any other law." The Malawi Police Service is headed by the President of Malawi and under the command of the Inspector General, operating under the auspices of the Ministry of Internal Affairs and Public Security. 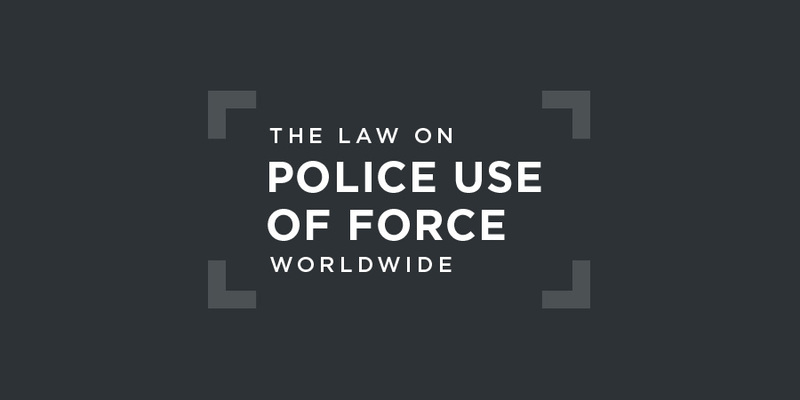 A range of laws govern police use of force in Malawi. Taken as a whole, they do not comply with international law and standards, in particular with respect to the use of firearms. Under the 1930 Penal Code, in effecting an arrest the means used must be necessary and the degree of force used must be reasonable. In assessing these factors, the court shall, in considering whether the means used were necessary, or the degree of force used was reasonable, for the apprehension of such person, have regard to the gravity of the offence which had been or was being committed by such person and the circumstances in which such offence had been or was being committed by such person.1930 Penal Code, chap. 7:01, s. 18 – "Use of force in effecting arrest". Under the 1960 Preservation of Public Security Act (as amended), any police officer or member of the armed forces of Malawi is empowered to effect an arrest or prevent the escape of a suspect and may "use such force as, in the circumstances of the case, may be reasonably necessary, which force may extend to the use of lethal weapons".Ch. 14:02, s. 7(3), 1960 Preservation of Public Security Act (as amended by Act 6 of 1994). (iv) the use of firearms under this section shall as far as possible be to disable and not to kill. In addition, Section 105(4) of the Police Act allows the use of firearms against a person attempting to destroy or damage "valuable" property. Subsection 5 provides that the level of force used must be no more than is necessary and appropriate in the circumstances. These rules, which allow use of firearms other than in the case of an imminent threat of death or serious injury or a proximate and grave threat to life, do not accord with international law and standards. iii. whilst so engaged, is using violence to him or another prison officer or other person. b. as in subsection (1) (a) (iii), (1) (b) (i) and (1) (b) (iii) is authorized unless the prison officer has reasonable grounds to believe that he or the other prison officer or other person, as the case may be, is in danger of suffering grievous bodily harm. (3) No prison officer shall in the presence of a prison officer senior to himself make use of a weapon as in subsection (1) is authorized, except on the orders of the senior prison officer. (4) The use of weapons in pursuance of this section shall be, as far as possible, to disable and not to kill. The national Police Service Commission was established under Chapter XV of the Constitution to "exercise disciplinary control" over members of the Police Service. A similar body, the Prisons Service Commission, was established under Chapter XVII of the Constitution with respect to prisons. In addition, the mandate of the Malawi Human Rights Commission "is to protect and promote human rights in Malawi in the broadest sense possible and to investigation violates of human rights on its own motion or upon complaints received from any person, class of persons or body." The Commission was established under Chapter XI of the Constitution as an independent national institution. The independence of this body is further guaranteed by the Human Rights Commission Act. concerned at the high number of reported cases of torture by law enforcement officers. It is also concerned that the law does not comply with international standards in regard to the use of firearms by police officers....Human Rights Committee, Concluding Observation on Malawi, UN doc. CCPR/C/MWI/CO/1/Add.1, 19 August 2014, para. 13. (d) Ensure that the Police Act complies with the Basic Principles on the Use of Force and Firearms by Law Enforcement Officials ... and strengthen its efforts to train police officers in human rights.Human Rights Committee, Concluding Observation on Malawi, UN doc. CCPR/C/MWI/CO/1/Add.1, 19 August 2014, para. 13. Reported incidents of police violence against children, including the recent shooting by police of unarmed child protestors, despite the efforts to curb police violence by establishing a professional standards unit to regulate the conduct of police officers, disciplinary committees and the national Independent Complaints Commission, which will hold police officers accountable.Committee on the Rights of the Child, Concluding Observations on Malawi, UN doc. CRC/C/MWI/CO/3-5, 6 March 2017, para. 20(e). The Committee recommended "providing police with special training on child-friendly techniques for dealing with children generally, and crowd control and dispersal in particular, and by introducing guidelines governing the use by police of deadly force. "Committee on the Rights of the Child, Concluding Observations on Malawi, UN doc. CRC/C/MWI/CO/3-5, 6 March 2017, para. 21(g). In 2015, in the Working Group of the Human Rights Council on Universal Periodic Review, the United Kingdom urged the Government of Malawi "to ensure the proportionate and appropriate use of firearms by the Malawi Police Service and to confirm that there was no shoot-to-kill policy".UN doc A/HRC/30/5, 20 July 2015, para. 79. Expedite the effective establishment and operationalization of the Independent Police Complaints Commission entitled to investigate complaints of brutality, deaths or misconduct at the hands of the police.At: para. 87. Adopt other comprehensive and adequate measures to effectively combat torture and excessive use of force by police officers and other State agents.At: para. 88. Further conduct investigations on all alleged cases of torture, brutality, deaths in custody and misconduct at the hands of the police, prosecute persons who are allegedly responsible, punish those who are convicted with adequate sanctions, and adequately compensate victims.At: para. 89. This case concerned an appeal to the African Commission on behalf of Aleka Banda, a prominent political figure then subject to imprisonment without legal charge or trial. In supplemental communications to the Commission in support of the appeal, Amnesty International reported torture, consisting of beatings and electrical shocks, in Malawian prisons, as well as the fatal shooting of peacefully striking workers.Achuthan and Another (on behalf of Banda and Others) v. Malawi (2000) AHRLR 144 (ACHPR 1995).In its decision, the Commission found such police shootings to be in clear violation of Article 4 of the African Charter, namely "Every human being shall be entitled to respect for his life". One of the leading cases on police use of force is R v. Cheuka.R v. Cheuka and others  MWHC 49.Although the court’s decision considers the limits on the legitimate use of firearms by the police as governed by the Police Act prior to its amendment by Act 12 of 2010, the substantive provisions were unchanged. The case concerned the shooting of a lorry driver in the back in the course of a police chase. The lorry collided with a minibus killing two passengers instantly. There was no evidence that the lorry driver was armed or that he posed a threat to the life of either the police officers or surrounding persons. The police officer responsible for the shooting was found guilty of three counts of manslaughter. Significantly the court relied on international human rights law, which it found “illuminating…useful and important in complementing the local laws.” The judgment cited several decisions of the European Court of Human Rights,Leonidis v. Greece (8 January 2009); Nachova v. Bulgaria (16 December 2003).as well as making reference to the 1990 Basic Principles on the Use of Force and Firearms by Law Enforcement Officials and the 1979 Code of Conduct for Law Enforcement Officials. Law enforcement officials, in carrying out their duty, shall, as far as possible apply non-violent means before resorting to the use of force or firearms. Whenever lawful use of force and firearms is unavoidable, law enforcement officials must exercise restraint and act in proportion to the seriousness of the offence and the legitimate objectives to be achieved. Regarding self-defence, law enforcement officials shall not use firearms against persons except in self-defence or in the defence of others against the imminent threat of death or serious injury, to prevent the perpetration of a particularly serious crime involving grave threat to life, to arrest a person presenting such danger and resisting their authority, or to prevent his or her escape. The … intentional lethal use of firearms may only be made when strictly unavoidable in order to protect life.